We hate to remind you of this, but it is very cold outside. So cold, in fact, that warnings have been issued. Now, you might be reading this from the warmth of your home or while sipping hot coffee at the office, but make no mistake, you will have to endure the freezing temperatures at some point. There is just no way around it. As the cold weather is bad news for most, it gets even worse; don’t expect a heatwave anytime soon. Even those who don’t mind cold weather are wishing spring would get here soon. You could just stay huddled up in your home all winter and suffer the winter blues, or you could do something about it. The one thing that will cheer you up for sure, even if just for a week or so, is taking a vacation somewhere where it is warm. Clear Vision Auto Glass, your Delaware windshield repair service, offers you a few awesome places to visit this winter. Warm weather and sunshine aren’t the only reasons to fly off to Panama this winter. The Spanish colonial architecture with their orange-tiled roofs of old town Panama City offers a pleasant contrast to skyscrapers and snow-covered streets. Here, you get to spend your days sipping iced beverages at an outdoor cafe, browsing unique markets and enjoying the sunset from a sandy beach. The Florida Keys are a string of tropical islands connected by a highway that stretches about 120 miles off the state’s southern tip. This destination is popular due to its beautiful beaches, water sports and art galleries. Oh, and it’s warm. If you wish to trade in a cold car with a dead battery, sub-zero temperatures and icy roads for sandy beaches, warm sunshine and palm trees, make this a destination. Las Vegas is a place people love to visit all year long, but when you are up to your knees in snow and suffering from freezing temperatures, it is the ideal spot to warm your toes. Not only can you expect decent weather and warm temperatures, the entertainment is sizzling. Just make sure you don’t feed the one-armed bandit all of your money. San Diego is well-known for its multitude of attractions as well as for its pleasant weather. While it might not be warm enough to go swimming, you can still enjoy taking a stroll on the beach not weighed down by a heavy winter coat and boots. Just a hop, skip and jump from Florida is the Bahamas, yet another fine destination if you wish to escape the wrath of winter. The warm waters are perfect for snorkeling, swimming, windsurfing and a myriad of other sports. Best of all, if you do decide to rent a car and travel, you won’t have have to scrape ice off the windshield. As you can clearly see, there are plenty of wonderful and warm destinations if you wish to escape the cold this winter. 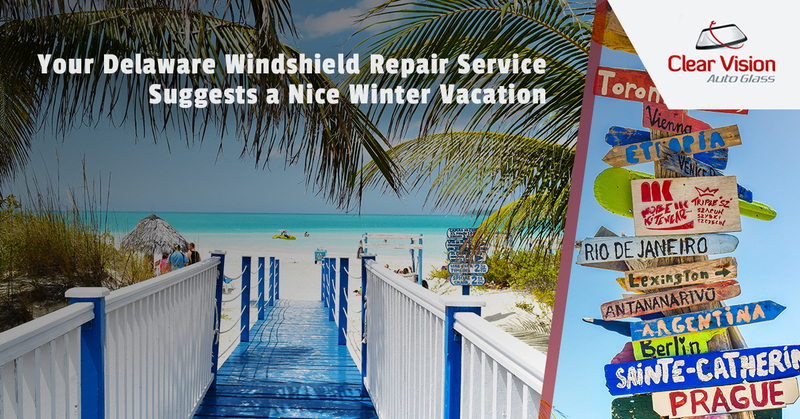 Before you head out of your winter vacation, have Clear Vision Auto Glass repair your windshield. Give us a call.